Photo credit: manganganath / 123RF. 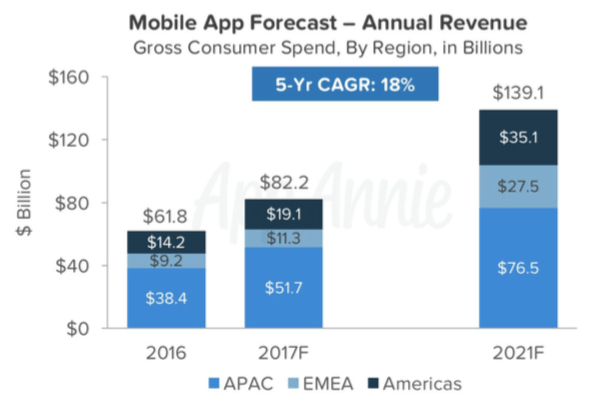 Mobile app data analytics firm App Annie projects a 33 percent growth in consumer spend on apps this year, rising from US$61.8 billion last year to US$82.2 billion in 2017. This is expected to grow at 18 percent annually to cross US$139 billion in 2021. This takes into account only the spend in app stores. There’s a parallel surge in mobile commerce and in-app advertising revenue, says App Annie. The bulk of the revenue comes from the Asia-Pacific region, dominated by China overall. 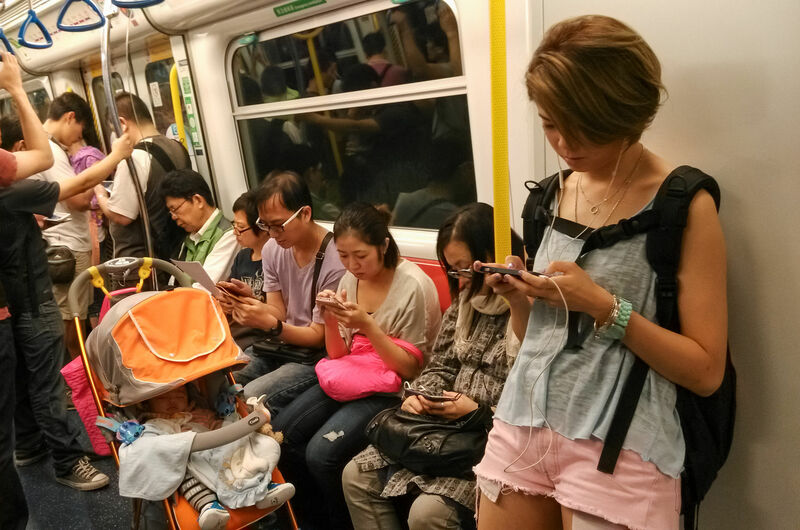 The most lucrative market, however, is Japan where the revenue per device is US$105. 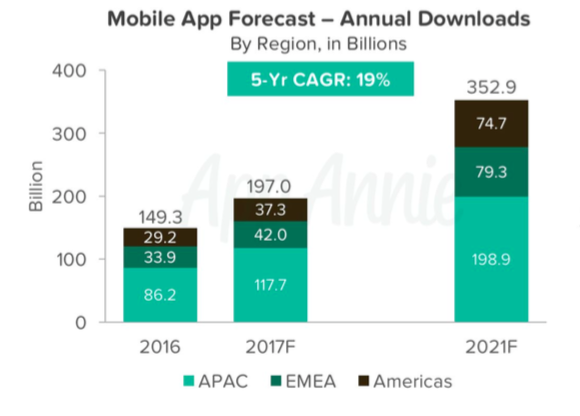 Asia Pacific also accounts for the lion’s share of app downloads which is expected to reach nearly 200 billion this year and cross 350 billion in 2021. However, when it comes to downloads, it is the fastest growing smartphone market of India that dominates, followed by Indonesia. “Consumers are spending twice as much time in apps than they did two years ago,” says Danielle Levitas, SVP of research at App Annie. Nearly 3 billion more consumers will be introduced to apps over the next five years in emerging markets, says the report. And as these markets mature, the trend so far has been of users increasingly engaging with and spending on the apps. These findings are from App Annie’s second annual App Store Forecast Report, which used a a proprietary algorithm to make predictions about the app marketplace. It gathered economic, demographic, behavioral, and technology sector-specific data from over 30,000 separate sources, including US Census Bureau and financial institutions like the European Central Bank. According to the company, its testing methodology for forecasts is similar to those used by major investment banks. This article was updated to include details about the testing methodology used to make these predictions.